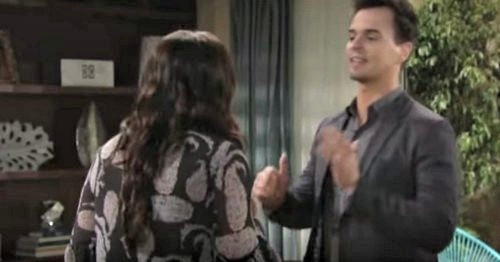 The Bold and the Beautiful (B&B) spoilers for Wednesday, February 28, tease that Katie (Heather Tom) will be in full-blown panic mode. Wyatt (Darin Brooks) and Katie tried to go up against Bill (Don Diamont), but his threats were quite extreme. Bill intends to seek custody of Will (Zane Achor) if Katie doesn’t back down. Katie will have a major meltdown once she’s alone with Wyatt. He’ll do his best to comfort her during all the drama. Wyatt might insist that there’s no need to worry. He could argue that if Bill follows through on his promise, they could always call the wedding off. It’s not what either one of them wants, but Katie would undoubtedly choose Will over Wyatt. However, they may not be ready to throw in the towel just yet. Wyatt and Katie at least need to put up a fight! Meanwhile, Bill (Don Diamont) will seethe as he meets with Justin (Aaron D. Spears). He plans to cut Wyatt off financially and prevent any future claims to a Spencer inheritance. It’s clear that Bill’s furious, but Justin might try to talk him down. Bill’s already lost one son, so it seems terrible to push away a second one. Nevertheless, Bill may not be willing to budge anytime soon. The Bold and the Beautiful spoilers say he’ll also have a fierce showdown with Ridge (Thorsten Kaye) on Wednesday’s new B&B episode, February 28. B&B fans can expect Sheila (Kimberlin Brown) to be intrigued by the conflict. She’ll file this incident in the back of her mind and hope she can use it to her advantage later. Elsewhere, Eric (John McCook) will get some stunning news. He’ll find out that Bill and Steffy’s (Jacqueline MacInnes Wood) hookup is the reason for Liam’s (Scott Clifton) sorrow. Eric will have a strong reaction once he’s in the loop. The Bold and the Beautiful spoilers say Quinn (Rena Sofer) will fret over her husband’s health. She’ll fear that Eric could have a heart attack or another serious medical issue. Quinn will struggle to calm Eric down as he rages over what Bill did to his granddaughter. Steffy and Bill’s one-night stand will continue to affect Liam as well. Hope (Annika Noelle) will remind him that it’s not too late to repair his marriage, but Liam still won’t be sure it’s possible. We’ll give you updates as other B&B details emerge. Stick with the CBS soap and don’t forget to check CDL often for the latest Bold and the Beautiful spoilers, updates and news.